"These are so easy to make, it is almost sinful. So rich and full of chocolate." Preheat the oven to 350 degrees F (180 degrees C). In a large bowl, combine the cake mix, oil, and eggs Beat with an electric beater for 3 to 4 minutes, until well blended. With a spoon, stir in the chopped candy. Drop by teaspoonfuls 2 inches apart on to cookie sheets that have been coated with nonstick baking spray. Bake for 9 to 11 minutes, or until the cookies are firm. Remove the cookies to a wire rack to cool completely. This dough is really dense. I have made this a couple of times to rave reviews from the chocoholics. 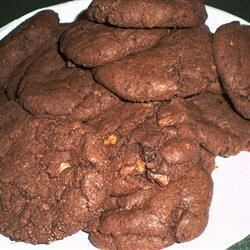 These cookies were delicious and so simple to make. Just 4 ingredients! They received lots of compliments. I love recipes like this. Very good cookie. Next time I will use more toffee. I also think I'll mix it by hand - the dough is fudgy, like a brownie and kept getting stuck in the mixer.